The Next Twist in the Vine: Climbing My Mission | Create. Communicate. Connect. How high we climb changes our perspective. 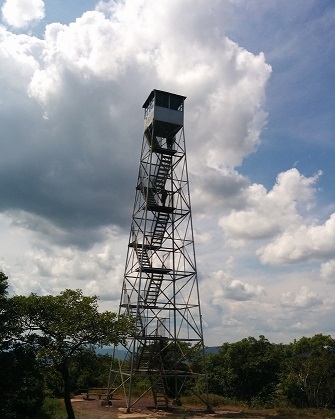 I experienced this is literally when I climbed this tower at the top of Overlook Mountain. I used to think that having a mission and vision meant that my purpose would plant me into the ground like a tree, and that my career would branch off from that one central root. On the contrary, I’ve come to learn that my mission and vision are more like Jack’s magic beans. Instead of my passion planting me, I planted the seeds of my passions ten years ago, and now I’m currently climbing the huge stalk that resulted. No matter how fast I climb, I know that if I look up I’ll see the stalk continues to grow higher than I can possibly see. Regardless of whether I’m climbing or staying put at any given moment, it excites me to look up and know that there will always be different ways and deeper ways to serve my mission. For me, that’s the joy of the journey – the beanstalk is always growing, always taking new shape, and it will never end. Within the past six months, I’ve pulled myself up to a newly discovered part of the vine. I have a firm hold of how I’m serving my mission and passion as an educator, and the climb to this new part of the stalk is an exploration of how I can more deeply connect my own writing and artistry to my educational mission. If I look up the stalk, I can see how bringing this strategic question I’m asking into the online realm has helped to grow this vine to exciting new heights. How social media has helped me realize that a mission has infinite potential to grow is the focus of my chapter in the upcoming book Empowered Women of Social Media: 44 Women Found Their Voices Using the Power of Social Networking. What fascinates me about this anthology – and the central reason that I’m a part of it – is that the chapters are written by women from so many different vocations, most of whom hold vastly different missions dear to their heart. Additionally, if you use my handy vine metaphor, each woman is at a different part of her climb. So there are opportunities to read about a woman like myself, still early in my climb to scale up my mission, and then right next my chapter there are stories from women who are more seasoned in utilizing social media to broaden impact. No matter where each woman is on her climb, in her chapter you’ll read about her amazing view of where she’s been and where she’s going, and how social media is helping to get her there. The resulting book is a powerful spectrum that guarantees a point of entry for any reader who is at any part of her or his own journey. As an educator and an artist, I love that there’s a way in for everyone. 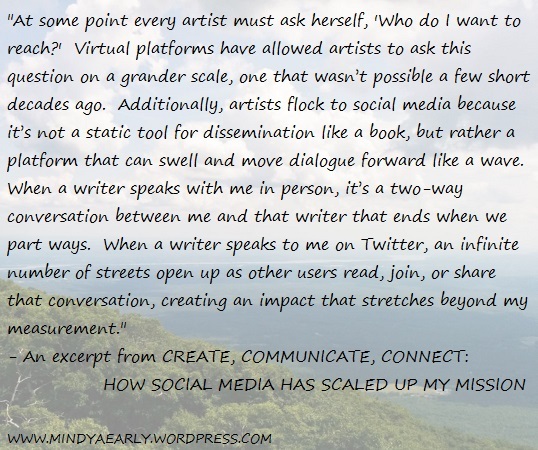 As you can see in the excerpt of my chapter to the left, I’m intrigued by the potential that social media affords both artists and educators to connect and inspire. Yes, potential – I’m convinced that we haven’t discovered the full range of possibilities these amazing networks have to connect different minds all over the world. After all, social media is and can be about so much more than promotion. It’s about conversation, and it can be about community-based exploration and creation, too. I know there are other artists, educators, and innovators out there who are hard at work exploring the potential of platforms like Twitter, Facebook, and more. I’m proud to stand with 43 of them in Empowered Women of Social Media. It’s my greatest hope that something in my chapter will spark an idea for an innovative reader to take us to the next twist of the social media vine. Are you that innovator? Let’s start a dialogue: are you an artist or educator who is trying to use social media as a way to further your mission, or do you know someone else out there who’s on the cutting edge of social media innovation? Say so in the comments! When you comment, be sure to mention your own social media or blog information so that I can connect with you and see the amazing things you’re doing and discovering. Thank you for supporting me, and these other 43 amazing women, by downloading your copy on the launch day! Empowered Women of Social Media: 44 Women Found Their Voices Using the Power of Social Networking will be released on October 5th. I encourage you to purchase it on the launch day, because on that day alone it will be just .99 cents if you purchase it on Kindle! Purchase your copy here! Social media has revolutionized communication and connection, and I’m convinced that it can revolutionize that what it means to create and discuss art, too. We just have to take it to that next level, together. Who’s with me? Pingback: Just Try It For Today: A Revision Prompt Challenge | Create. Communicate. Connect. 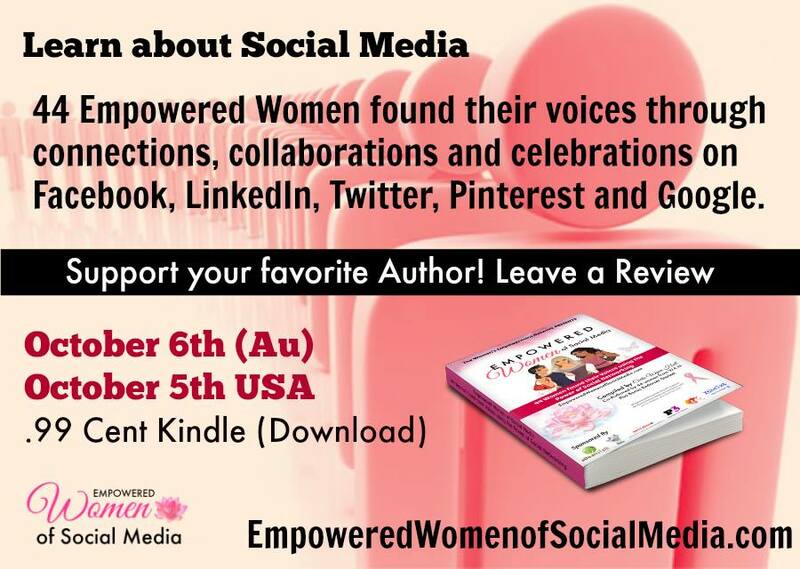 as one of your co-authors in the book Empowered Women of Social Media, I stand shoulder to shoulder with you! Honored to stand with you, fellow writer, and I’ve loved learned from you over the past few months. ❤ Love all the work you do in and around http://www.themagichappens.com!